Fans have been waiting ten years for Sonic to shine again. Sega's blue icon garners a near-religious blind faith from some even though he's not delivered a truly exceptional game for a long time. It's actually surprising that it's taken this long for the speedy mammal to borrow an idea or two from his oldest rival, Mario. Lost World is simply Sonic does Super Mario Galaxy (it's a somewhat gross exaggeration with a grain of truth, though you'll never get the devs to admit it). It also uses the split gameplay - 2D and 3D - of anniversary title Sonic Generations. Those stages in the third dimension are no longer a series of straight race-style paths, but cylindric pipes on which Sonic can run round the entire length and circumference of. 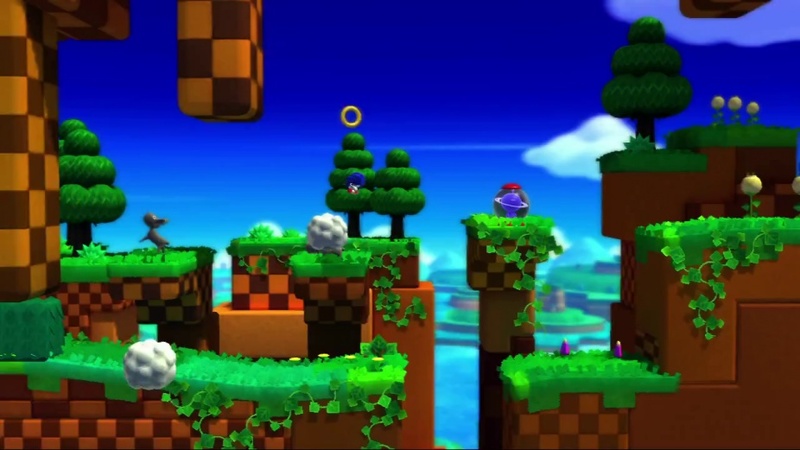 The same idea used by Nintendo in Super Mario Galaxy, though without the heavier emphasis on centralised gravity, and given the emphasis on speed with the hedgehog, exploration's been tossed into oblivion. Instead, this new gameplay style and perspective heightens the roller coaster effect that seems to be the focus ever since Sonic raced into the 3D world. The results are a mixed bag, working best when the developers blend new ideas into the best of the series' past efforts in the 2D levels, with enclosed corridors, and secrets hidden behind changing perspectives. Unfortunately Lost World also falls into the pitfalls of previous 3D games, as you feel like you're playing a QTE sequence with timed button presses. Movement is so fast on some of the 3D stages it feels like Sega see no other solution but to take control from the player. So you sit back, press a button and bounce along a few platforms. Which quickly becomes boring. The 2D sections are a different story as the pace slows. For the first time Sega have realised that control needs tightening and so Sonic's now got a dedicated run button alongside his spin dash attack one. It means you spend time platforming and exploring properly. Prior to the launch of Sonic Lost World there was a big push for The Deadly Six, a new breed of enemies for the ‘hog to tackle. Sadly all are about as generic as they come as far as their personalities and looks go. At least the challenges that come with fighting them are interesting, as they often play with the perspectives and shifting platforms to such an extent that you often have to combine reflexes with a little ingenuity. Lost World contains elements that'd make for a really good, solid title. Unfortunately it also contains some that aren't as creative, and the links between everything haven't been as polished as they need to be. As a result we have yet another chapter in the icon's life that's far from his greatest, and struggles to be relevant. A pity.